I. Love. Loops. Earrings that is...I don't know what it is, they kind of go with everything, or at least I think so. I consider myself a pretty progressive person. Never really one to be in a fashion rut, open to trying new things. Right? I mean, it's only fashion...it's not like trying on a new color, silhouette or pattern is tattoo permanent. So why can't I seem to put down the hoop earrings? Have you noticed? Gold hoops, silver hoops, rose gold. Big ones, small ones, round ones, oblong ones...it's endless! Well clearly I need to be shaken up a bit. I'm challenging myself to get out of the loop hoops! I won't abandon them completely but I really should be wearing more than one kind of earring, it's pretty ridiculous! Recently, I've been tip toeing into other styles (see my last blog post). Now, I'm ready to swan dive into the pool of gorgeous, interesting earrings. My only prerequisite is that they are sizable. Definitely not a teeny tiny earring gal'. So, I looked and I looked and here's what tickled my fancy. What do you guys think? Of course, I want them all! TIP: When trying something new, I often look to my favorite budget friendly retailers so that 1. I can get more than one piece when trying to amass a collection and 2. I'm not making a big investment if I suddenly change my mind and decide not to commit to a look. 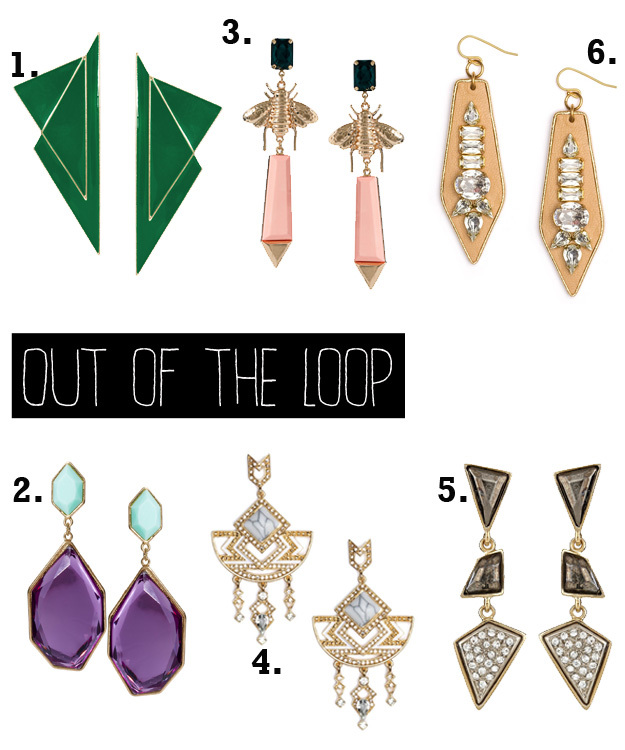 ASOS and Bauble Bar are 2 of my fav costume jewelry resources. I also am a huge Kenneth Jay Lane fan, his pieces are a little more pricey but there's few things that he makes that I do love so totally worth the cost.